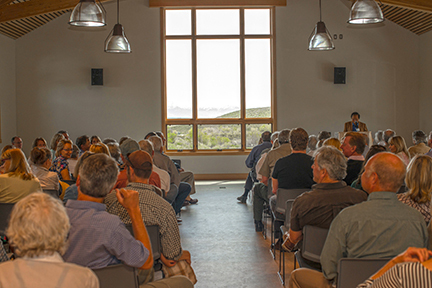 Long a locus for research in eastern California, the Sierra Nevada Aquatic Research Laboratory (SNARL) near Mammoth Lakes now has a new energy-neutral meeting hall located on reserve lands. The nearly 2,700-square-foot Page Center features stunning views of nearby mountain peaks and can seat up to 120 people. 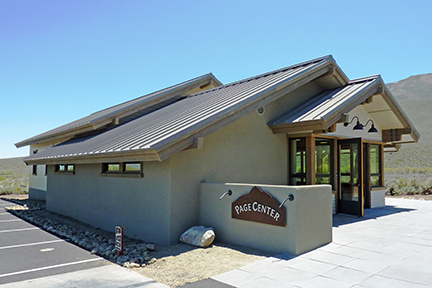 Located on reserve grounds, the Page Center will serve as a multi-use lecture hall and classroom for the eastern California reserve. SNARL is part of the 39-reserve University of California Natural Reserve System, the largest university-administered reserve system in the world. SNARL is one of seven NRS reserves administered by UC Santa Barbara. “We're very excited and proud to have this project completed. 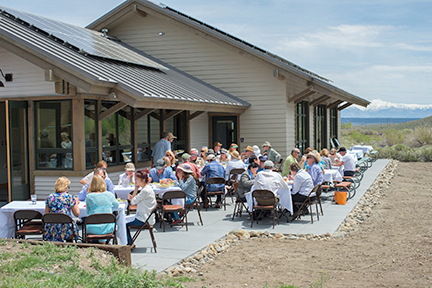 We believe it’ll create many more opportunities for education, collaboration, and the cross-fertilization that field stations are famous for,” said Daniel Dawson, director of both SNARL and nearby Valentine Camp Reserve. "Having a multi-use classroom building has been a longtime objective," Dawson said. Previously the only reserve meeting space available was the Green Church building near Mammoth Yosemite Airport, which the reserve bought for that purpose in 1989. Despite its contemplative origins, the church wasn't conducive to thoughtful lectures and meetings. "There was lots of highway and traffic noise. And the furnace was so loud you couldn't run it during a lecture. We'd have to warm it all day and turn it off before the lecture," Dawson says. Worse yet, reserve users found it to be inconveniently far from the reserve. "We even built a trail there so you could walk and not drive, but faculty had a hard time organizing classes to get there, and they'd wind up cramming everyone into the dorm instead," Dawson says. More recently, expansion efforts by the airport threatened to put an end to public assemblies at the church. Then the stars aligned to build a functional meeting place for the reserve. 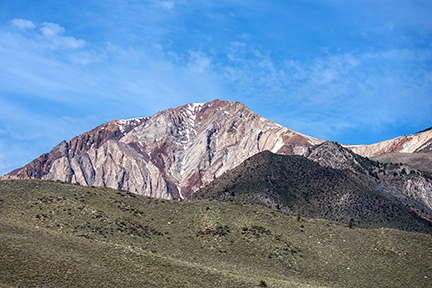 Dawson cobbled together $1 million from a facility infrastructure grant by the state Wildlife Conservation Board with a major donation from Mammoth Lakes residents Paul and Kate Page, who have been longtime volunteers at and benefactors of SNARL and Valentine Camp Reserve. On top of their more than 20 years of philanthropy to the reserves, the Pages donated a large bequest to maintain and support future modernizations of the building. Additional donors include the about 30 donor families who support the Valentine Reserve Fund, set up to benefit projects at SNARL and Valentine Camp Reserve. "I see this project as completely evolving the way in which this field research station will be used in the future," said retired technology entrepreneur Paul Page. "It changes the dynamics, in my opinion. All this time, they haven’t had an effective place where teachers and students and researchers could meet and collaborate." So far, the Page Center has hosted two talks in the 2015 SNARL Lecture Series. A full schedule of classes visiting the reserve from institutions ranging from UC Berkeley to the University of Redlands to the University of Leeds, should keep the center buzzing all summer. The new center was unveiled at a ceremony May 30. 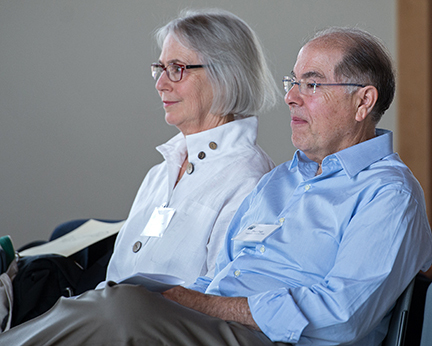 Attendees included UC Santa Barbara Chancellor Henry T. Yang and his wife Dilling; NRS Director Peggy Fiedler, who spoke about the 39-reserve NRS system; Patricia Holden, director of UCSB’s Natural Reserve System and a professor at the Bren School of Environmental Science & Management. The center has a large central meeting room with the capacity to hold room dividers, and a lobby that can serve as additional space for smaller groups. The audio-visual system was designed with most components located in the podium instead of mounted on the walls, enabling easy swap-outs to keep pace with future technology changes. A net-zero energy facility, the Page Center was designed to use no power from the grid. Its solar array should generate enough power to cover all of its own electricity, heating, and cooling needs. Not only does the roof feature a large array of solar panels, but the building uses an efficient ground source heating system to moderate temperature. Below ten feet, the ground remains at a temperature equal to the average annual temperature of the location. At SNARL, the ground stays between 58 and 62 degrees Fahrenheit all year, enabling it to serve as a heat sink or source of warmth. The Page Center's ground source heating system consists of a network of five pipe loops filled with antifreeze extending 150 feet deep underneath the parking lot. A pump circulates the loop liquid to exchange heat energy and keep the building at a comfortable temperature. "In summer it will flow energy in the grid, and during the cold winter, it will draw from that to run the heat pump," Dawson said. “We hope the energy attributes of the building serve as a model for other projects locally, and across the NRS and the University of California,” Dawson says.